Tired of the same old school lunches every day? I have two heading to school this year and we’re shaking it up a bit. 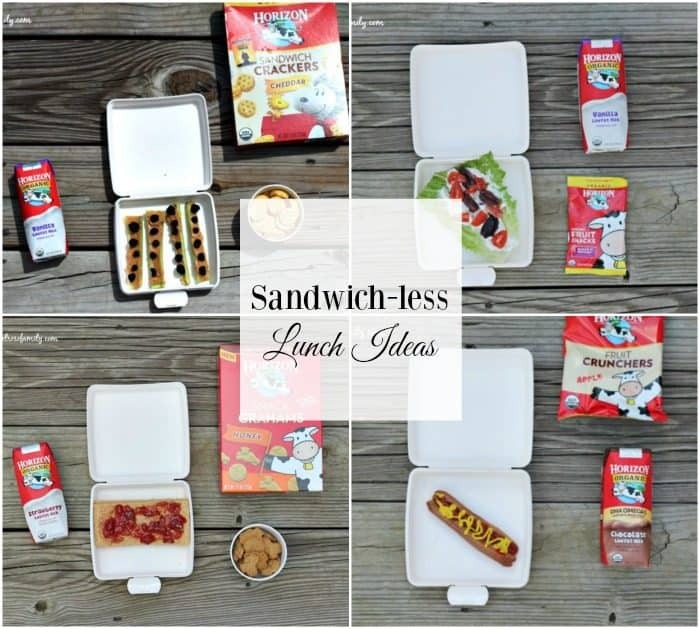 These sandwich-less lunch ideas paired with a snack and drink will have your kids asking for more! 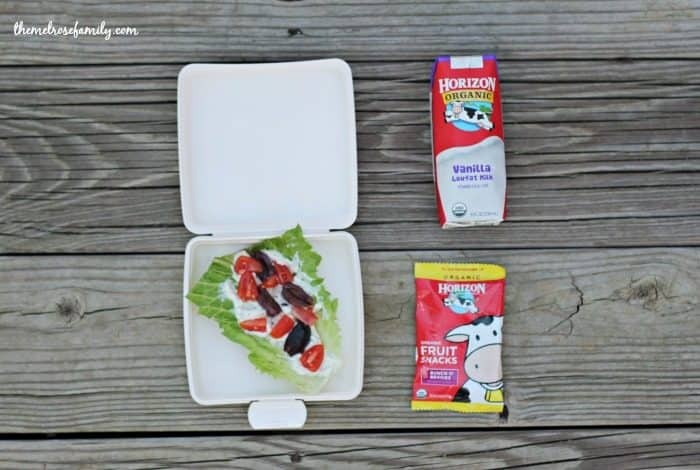 My top choice for our sandwich-less lunch ideas is our Vegetarian Greek Lettuce Wraps paired with Horizon Organic Vanilla Lowfat Milk and Horizon Fruit Snacks. This is also the favorite lunch idea of my three year old, but that’s largely due to the fact that she gobbles up Horizon fruit snacks every chance that she gets. I have to admit that they are definitely a favorite of mine as well. Have you heard of ants on a log before? I hadn’t until last year when my then kindergartner came home from school talking about how her friend ate ants for lunch. I was thoroughly confused until she explained that the ants were actually raisins sitting on top of peanut butter in a slice of celery. I quickly breathed a sigh of relief. My youngest is not a fan of raisins, but she loves dried blueberries which I learned when I made our Blueberry & Lemon Energy Bites. So our ants became dried blueberries instead of raisins. 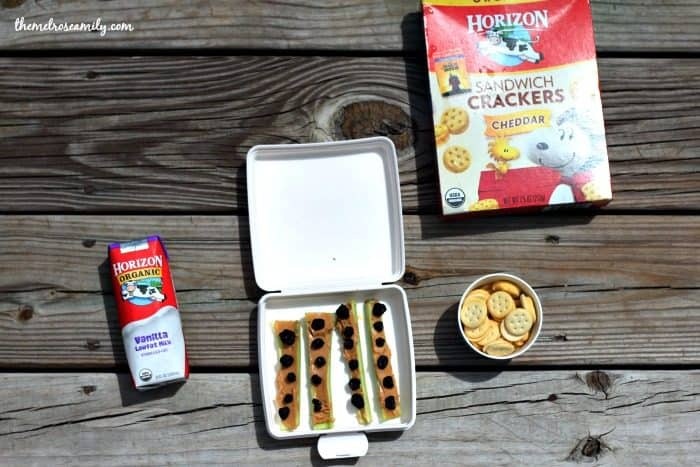 I paired our blueberry ants on a log with Horizon Cheddar Sandwich Crackers and Vanilla Lowfat Milk. Last year, my kindergartner wanted peanut butter and jelly for the first six months of school and then she hated it. I’m bringing it back though with these peanut butter and jelly graham crackers. 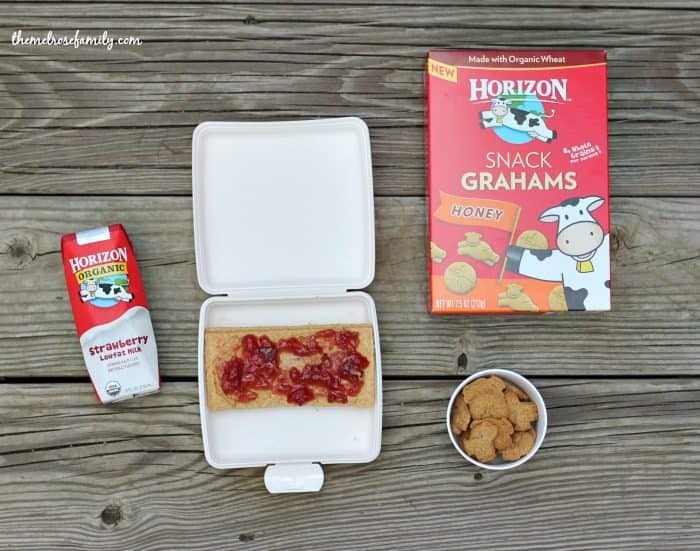 Horizon Strawberry Lowfat Milk was definitely the way to go with this lunch idea. Oh, and let me just tell you that the Horizon Honey Snack Grahams are addictive. I literally ate an entire box during quiet time. So good! Our final sandwich-less lunch idea is my oldest daughter’s favorite. A bun-less hot dog with ketchup and mustard. I cook the hot dog in the microwave in the morning and then cut it down the middle before dressing it with ketchup and mustard. 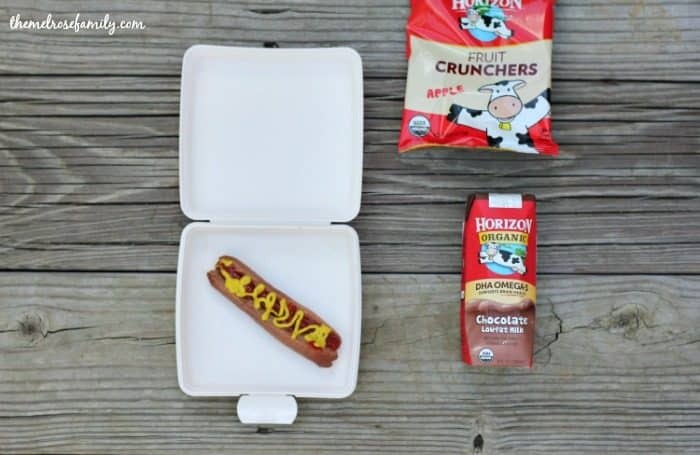 Nothing goes with a hot dog quite like Horizon Chocolate Milk as well. This is definitely the least healthy option so I paired it with Horizon Apple Fruit Crunchers. Be sure to sign up for Horizon Organic’s newsletter so that you can receive the latest coupons, offers and recipes. Plus you can follow along with Horizon Organic on Facebook, Twitter, Instagram and Pinterest. As a kid I always had a sandwich in my lunch. As much as I love sandwiches, it would have been nice to have one of these lunches.